This cake goes by several names. One is Kvæfjordkaka, or cake from Kvæafjord, a fjord in Northern Norway. It's also called Verdens Beste, or World's Best, and R says you're likely to find it at any celebration where the World's Best cake is necessary. He claims to remember there being one at his confirmation, and has a feeling his sister had one in addition to her wedding cake. It's appropriate, then, that R's sister translated their family recipe for us after our own wedding. To tell you the truth, given how popular it seems to be in Norway, I can't imagine how it hasn't swept the world, in the way the Australian Pavlova has. If I were given the choice between the two, both being meringue-based desserts, I'd choose the World's Best any day. Before we get started, I should warn you. This is going to be one of those projects during which you're going to be sure that you've messed up along the way. You haven't. Just go with it, and it will turn out great. A few notes on ingredients: Norwegians call egg yolks "egg plums" and I think that's just about the best descriptor you could ask for. I move that we adopt the name in English immediately. Secondly, the recipe calls for vanilla sugar, but Norwegian vanilla sugar isn't the granulated kind I've seen in the US. Instead, it's more of a vanilla-infused powdered sugar. So if you can't buy it, I'd make it by letting a vanilla bean sit in a bag of powdered sugar. Alternately, if you have granulated vanilla sugar, you could wizz it in your food processor of a few moments to powder it. Finally, the cream in the center is made party from a mix that is a Norwegian instant vanilla sauce. You can find it on Amazon, here. We bought it at the Norwegian Seaman's Church, here in NYC, which is actually also where we found authentic Norwegian vanilla sugar as well. If you want to substitute, just use a domestic instant pudding mix thinned with 1 to 1/2 cups of cream (we used 1 cup because it's best for the filling to be thick), or use a rum cake filling as I've seen suggested. And now a note on equipment: When R's mother makes this, she does it in one large piece, which is then cut in half to make the bottom and top of the cake. We, however, have a little mini-oven, and decided to do it in two batches instead. We made it on two cookie sheets, and baked them on two racks in the oven, switching them half-way through. 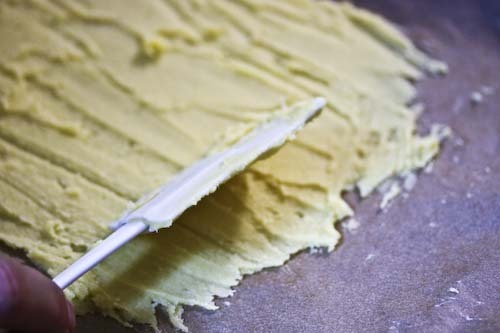 Beat the butter and sugar until fluffy and light yellow. Add the egg yolks, the flour, the vanilla sugar and the baking powder and stir until combined. Line two cookie sheets with parchment paper. Divide the batter in half, and with a spatula, spread half of the batter on one of the cookie sheets in a very, very thin rectangle. I'd estimate that ours was about 6x8 inches. Do the same with the second half of the batter. Set aside. (You'll feel like your cake is totally wrong at this point, like it's too thin and sticky and hard to spread, and will never be a cake. You're wrong. It's just as it's supposed to be.) Set aside. Preheat the oven to 350F. In a clean bowl, with clean beaters, whip the egg whites. As they begin to thicken, add the sugar and continue to whip until it's thick and sticky and, well, a meringue. Divide the meringue in half. Pour half over one of the cake batters spread on the cookie sheets. Using a spatula, spread the meringue out over the cake, making a rectangle a couple of inches larger than the rectangle of cake batter. 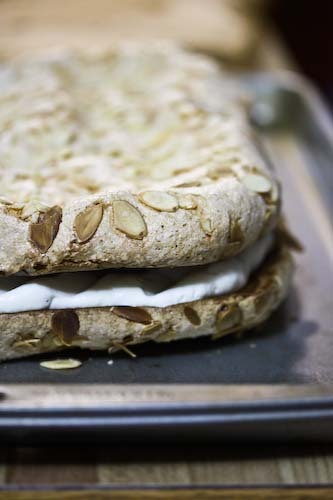 Sprinkle half of the almond slices on top. Repeat with the other half of the meringue, on the other half of the cake batter. Bake in the oven for about 40 minutes until the meringue is cooked through. Remove from the oven and cool to room temperature. Make a 50 gram package of instant vanilla sauce according to package directions. You do this usually by whisking boiling water into the powder to make a kind of pudding. But you want it quite thick, so use only a bit of water, probably not the full amount called for by the package. In another clean, cold bowl, whip 1 cup of heavy cream with the vanilla sauce. 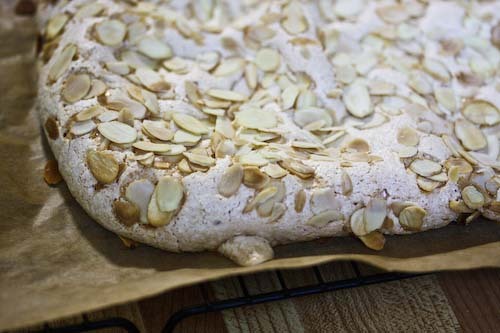 Once the cake is cooled to room temperature, flip one of the cake sides over so that the almonds are facing down. Layer the filling on top, then place the other cake side over that to create a sandwich. The second cake side should be almonds side up. Refrigerate, then serve. The cake can be made completely a day in advance and kept in the refrigerator. This sounds delicious! 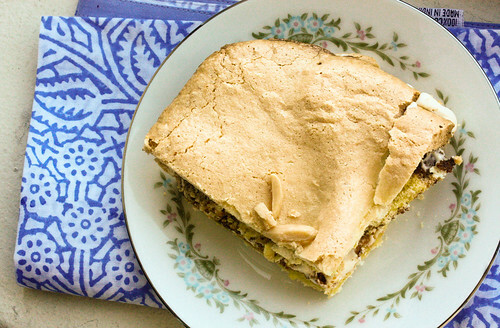 Almonds, cake, meringue, custard...what more could anyone want? I'd love to see a slice to see what became of the batter. Could you be so kind as to offer an approximate measure of the area that you spread that cake "batter" out to? I have several sizes of cookie sheets, so a "guesstimate" would be helpful. I'm so excited to have found your blog. My grandparents were Swedish and have never found any Swedish food I've cared for, but finding Norwegian that looks amazing (as this does!) is almost as exciting. Oh ye! This sounds great. I love every single part of it, will have to try! This looks so light and lovely, and I think it would be very simple for me to adapt to be gluten free! Thanks I had never heard of this dessert before! Mary, I'm so sorry. I meant to take a picture of a slice, but our guests decimated it before I had a chance. 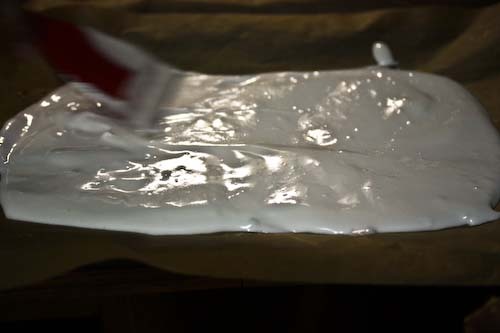 You don't end up being able to see the batter very well, it just sticks to the bottom of the meringue in a very thin layer and kind of gives it some support. 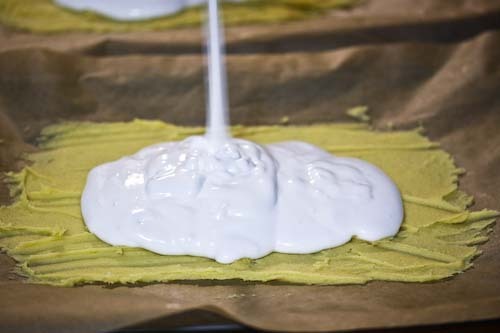 The meringue is poured out to an area larger than the batter. Marti, this was part of a larger project, a Norwegian Feast for Foodbuzz's 24 24 24. I made two desserts, appetizers, and two entrees, if you're interested in some more Norwegian food! I would say that we spread the batter out to about 6" x 8" in our cookie sheets. But it really doesn't matter as it's done totally free form. As long as you get it thin. I'll add a note to the recipe as well. Jenn, I think this recipe would very easily be gluten free. The cake batter is a pretty minor player to begin with. Let me know if you try it! This is a new one on me. But it looks sensational. 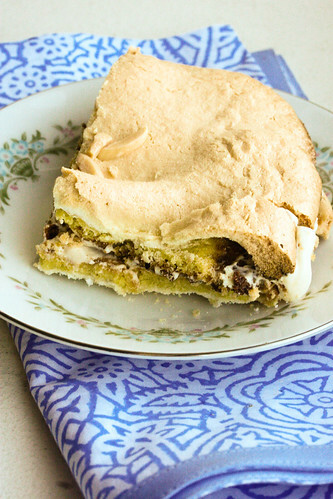 Hi Andrea, this cake reminds me of one I made from Joy of Cooking many years ago called Blitz Torte---cake batter topped with meringue decorated with slivered almonds before going into the oven---was baked in round pans though--filled with custard---melts in your mouth! It was one of my first cakes baked as a newlywed and impressed everyone! 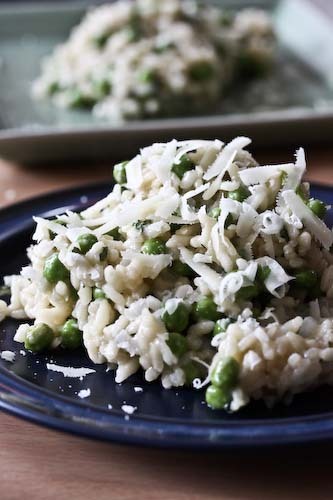 It's so weird (but good) to find this recipe on an American blog. I've eaten a thousand slices of this, but have yet to try making it myself. This weekend is midsummer's and I'll be trying out my mother-in-law's recipe (we call it Verdens Beste in Sogn og Fjordane). It's been really fun looking through your recipe index, seems like we like making a lot of the same things, ie: sirupsnipper, eplekake, rabarbrakake, lefse (although I've never posted it on my blog, and quite frankly, Norwegians don't bother making it themselves, although Norwegian-Americans love to). Anyways, you have gorgeous photos and a really intersting assortment of recipes- I'll be checking back in all the time now. Can we use vanilla custard to replace instant vanilla sauce? Anonymous, yes I think so. As long as it's not too runny. Happy baking!